Library Chronicles: "Charlie Brown, you're the only person I know who can take a wonderful season like Christmas and turn it into a problem"
"Charlie Brown, you're the only person I know who can take a wonderful season like Christmas and turn it into a problem"
I'm not actually trying to pile on poor Charles Brown here. He was responsible for the moment in Sunday's game where even the more level headed Saints fans began to lose hope. Brown in the second quarter negated an 8-yard TD catch by Lance Moore with an illegal-use-of-hands penalty. Kicker Garrett Hartley subsequently tried a 36-yard field goal, but it was blocked by defensive tackle Michael Brockers with 2 seconds left in the half, giving St. Louis a 24-3 halftime lead. But it's silly to pin that stinker performance on Brown alone. Besides, Sean Payton has done enough picking on him already. "I saw enough, period," Payton said. "It was enough penalties, pressures, sacks. It was enough. At some point you can’t just keep watching it." Saints fans should have seen this coming when they opened up their morning internet devices and pointed them at Jeff Duncan's column. Duncan was arguing (some say backhandedly) in favor of Coach Of The Year consideration for Payton partially because of his work with telling Charles Brown not to hold people. Guess that whole losing Patrick Robinson for the year to injury is a bonus stroke of coaching genius, right? But, as long as Brown is suiting up each week, these little issues can still pop up. Anyway, it took a while for the press to catch up with Brown. He wasn't in the mood to talk in the locker room, but he did have this to say later while in the course of holiday preparations. The good news is there will still be more football. It would be ungrateful for Saints fans to fail to recognize 10 wins with a chance for much better as anything other than a blessing... not exactly a Christmas miracle or anything, but it's important not to take these seasons for granted. These are still the good times. The Saints have one more opportunity to lay this increasingly vexing "can't win on the road" trope to rest and claim the division in the process. And even if they don't there will be plenty to talk about with a difficult trip to the playoffs ahead of them. Meanwhile, there's the matter of improving on Charles Brown's Christmas display. In that spirit, we present Celebration In The Sinkhole 2013. 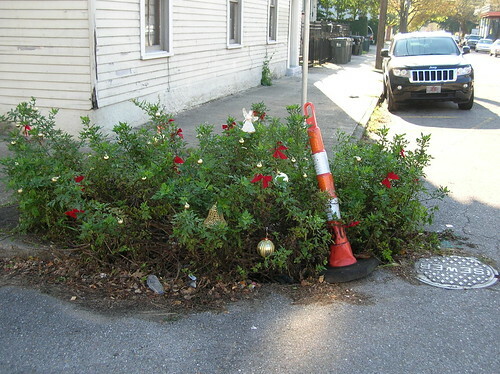 This year's theme: "Dreaming Of A Safety Orange Christmas"
Like the Saints, in 2013, this sinkhole isn't always pretty. But it's still a pretty neat thing to look at. Linus Van Pelt: I never thought it was such a bad little tree. It's not bad at all, really. Maybe it just needs a little love. producer of “Football Today” and “Fantasy Focus”). Still, despite the San Francisco game, the Saints are not a team that’s getting calls*. Not trying to blame the refs for this year’s losses, but as football calls become more subjective, it is reasonable to wonder if press coverage affects officiating, which is increasingly affects the final score. *Getting non-calls is actually the way it usually works out.